Much as you may have been satisfied with the way iCloud synced your data in the past, if you’d hoped for comprehensive file syncing between your Mac, iOS devices, and the cloud, you were likely frustrated. Prior to OS X 10.10 Yosemite, iCloud’s file storage was sandboxed, meaning that you could only access files created with a specific application by that application. You could, for example, launch Pages and access the Pages files you stored in the cloud, but you couldn’t use that same app to open TextEdit files stored in iCloud. Enter iCloud Drive. Taking its cue from Dropbox, which is a simple file repository accessible from any app, Apple has changed the way iCloud manages files. 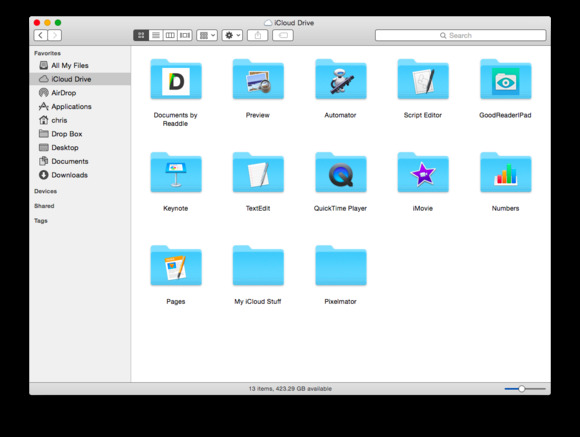 iCloud Drive holds folders for associated apps, folders you create, and documents. To use a file on a Mac, open the folder that holds it and double-click on it (see the screenshot above where there are folders for Numbers, Pages, and TextEdit) or launch an app, use the Open command, and navigate to it on your iCloud Drive. For example, in the image below you can see the Open dialog when you launch Numbers. At the top of the sidebar is the iCloud heading with the Numbers entry below. This is a shortcut to the Numbers folder stored in iCloud Drive. Access any files in iCloud Drive from a standard Open dialog. You can now also access files you created with other apps (and other apps can access files you’ve created with iCloud-compatible apps). Let’s say you’re writing a report in Pages and you use a compatible text file that you created in TextEdit—a file saved in Microsoft Word .docx format, for example. You can launch Pages, choose iCloud Drive in the Finder sidebar, select a compatible document in the TextEdit folder, and open it. iCloud Drive lets you move files between your Mac and the cloud. There are two ways to do this. The first is to simply move a file in the Finder. When you do this, the Finder displays a dialog, warning you that when you move it to your Mac it will be deleted from your iCloud Drive. The other way to move a file is from within an app itself. If you have a file open and you want to move it between your Mac and iCloud Drive, choose File > Move To, and then select a location. The file will be moved but you won’t be warned about it being deleted from your iCloud Drive. In the Finder you can also copy a file from iCloud Drive and paste it into any other folder. Just select the file, press Command-C, navigate to a folder, and press Command-V. If you do this, though, remember that you now have two copies of the same file. And you can send an iCloud Drive file to others in a variety of ways. Within the Finder, open your iCloud Drive, select a file, and then click on the toolbar’s Share menu. You’ll find options for sharing via Mail, Messages, AirDrop, and More. Select More and System Preferences launches and the Extensions preference appears, where you can select additional sharing options (not all of them may be compatible with sharing particular file types, however). iCloud Drive is also available from your browser. Sign into icloud.com and click iCloud Drive. From within the resulting window you can manage all your files and folders—download and upload files, create new folders, and move files into new folders or to the root level of your iCloud Drive. Any changes you make on the web or on your Mac are propagated to all your devices, but it may take a minute to see them. 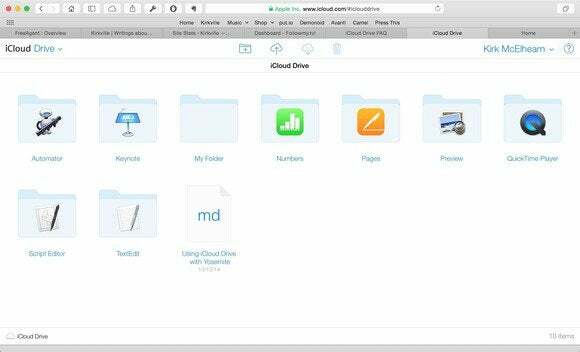 Access all the files you store in iCloud Drive from your browser. Using the web versions of the iWork apps—Pages, Numbers, and Keynote—you’ll be able to work with compatible documents stored on iCloud Drive. For example, launch the web version of Pages and the Pages documents you’ve stored on iCloud Drive will be available to you. Select one and get to work. There is no iCloud Drive iOS app so you don’t have Finder-like access to the files in your iCloud Drive. Instead, you access them through an Open command within individual apps. Let’s use Pages as an example. Your iCloud Drive as seen through a compatible iOS 8 app. On your Mac you’ve saved a .txt file into iCloud Drive’s TextEdit folder. On your iPad, launch Pages, click the Plus (+) button in the top-left corner, and choose iCloud. An iCloud window appears that displays the contents of your iCloud Drive. Tap on the TextEdit folder and then tap a compatible file (Pages won’t open RTF files). A copy of that file will open in Pages. iOS apps written to take advantage of iCloud Drive can additionally export their files to an iCloud Drive folder. We’ll use Pages again. Within Pages open a document, tap the Share icon, and tap Send a Copy. In the Send a Copy window that appears choose an output format (Pages, PDF, Word, or ePub). The file will be converted and a Choose How to Send window will appear. Tap on Send To and the iCloud window appears. Tap a folder where you’d like to store the document and, at the bottom of the resulting window, tap Export to this location. The file will be copied to that folder on your iCloud Drive. Compatible apps such as Readdle's Documents 5 allow you to export files to iCloud Drive. iCloud Drive is less flexible than other cloud storage services, such as Dropbox, Box.com, Google Drive, OneDrive, and MediaFire. Outside of the options available in the Sharing menu you can’t share and sync your iCloud Drive documents with others, for example, thus making document collaboration tricky. With these third-party storage services you can send a link to anyone so they can download a file. With iCloud Drive you can share files this way only with documents created with iWork apps. iCloud Drive has other limitations as well. You’ll need OS X Yosemite and iOS 8 and you can’t save files larger than 15GB, for example. Also, large amounts of additional storage is more expensive than from competing services. While you get 5GB of storage for free (which you share across all your iCloud-associated devices), 1TB of storage costs $20 a month. Dropbox offers 1TB for only $10 a month. However, you can purchase additional iCloud storage in smaller increments than Dropbox allows. For example, you can get 20GB of additional storage for $.99 a month and 200GB for $3.99 a month. For now, iCloud Drive is a useful way to access some of your files on different devices including Macs, Windows PCs, and iOS devices. As time goes on it will become more helpful as additional third-party apps are updated to take advantage of it.